Are you a thing or are you a human? If someone wishes to assess your potential contributions to this life we live, what is the best starting assumption: thing or human? The questions may seem silly. But a recent report from the RAND Corporation bores in on how regular medicine reduced complementary and alternative medicine professionals to "thing" status -- as "modalities" -- in the first years of the integrative medicine era. The title of the report is "Complementary and Alternative Medicine: Professions or Modalities?" The discussions among policy makers, practitioners and delivery system leaders synthesized in the 75-page document beg a more significant question: Does the emergence of values-based medicine urge a major re-think regarding the potential contributions of these professionals? The case statement by RAND's Patricia Herman, ND, PhD and Ian Coulter, PhD begins with a blunt irony. "One of the hallmarks of complementary and alternative medicine (CAM) is treatment of the whole person." Yet in the fee-for-service procedure and production orientation of the medical industry, licensed practitioners of chiropractic, acupuncture and Oriental medicine, and naturopathic medicine were typically stripped of this core value -- treating the whole person -- before being put to any use. Regular medicine's dominant influence when "CAM" integration by medical delivery organizations began in the mid-1990s was the industrial value of service production. Mayo Clinic's director of innovation captures this concisely when he recently spoke of medicine's historic focus on "producing" services rather than on "creating health." A precedent for this boiling down of a chiropractor's potential value in human health to thing status was set for chiropractors decades earlier in Medicare. In that even more intransigent fee-for-service era, only adjustment of the spine for low back pain made the grade. Unremunerated was the time that a chiropractor spends in evaluation and management. Most of the chiropractic professional's education and practice rights were dumped overboard. No value was placed on a chiropractor's counseling of patients on diet, lifestyle, dietary supplements, or ergonomics, for instance. Getting into Medicare at all back then was a victory for the field. But a consequence of this limited economic relationship was the rack 'em and crack 'em - as fast as possible method of treatment. Produce! The humans who chose to become acupuncture and Oriental medicine professionals were similarly reduced. The broad based education and scope of practice as general practitioner of East Asian medicine was diminished in the way that a whole herb is discarded for what is believed an active agent that can be synthesized as a pharmaceutical drug. The multiple modalities in such a professional's toolkit include not only acupuncture but counseling and relationship, dietary advice, cupping, moxibustion, Chinese herbs, and more. Yet the medical industry reduced this whole practice to needles. Acupuncturist = needler. Acupuncturist as cog in a medical production machine. I recall an interview nearly 20 years ago while reporting on the first insurance programs for these professionals in California. The insurer only covered needling, and at a low visit rate. My interviewee, a long-time licensed practitioner, said that she would participate in insurance. Then she added that her "insurance patients won't get everything my other patients usually get - not for that amount." Rack 'em and needle 'em. Ca-ching! Only the ca-ching sound of the "CAM" practitioner thus limited in value could barely be heard amidst the now $3-trillion per year blazing crackle of hospital-centric medical services. As procedures go, the needling, the manipulation, the massage treatment and the time-consuming naturopathic intake are as twigs in a fire storm. With the possible exception of an assembly line chiropractic practice, all have a lousy income to time ratio. As producers of income via these procedures, these "CAM" types often got laughed right off the bottom line - and right out of the delivery organization's business plan. Many of us began to postulate that the big money in integrative health and medicine was not in producing profit but in saving money for the system. Yet with fee-for-service medicine focused on production of money-making services and the economic value of integrative health potentially in limiting the need for these very procedures, the two are oil and water. The medical industry operated with perverse incentives toward engaging the best use of these practitioners as professionals. Their value was as a thing, a modality - and there just wasn't much juice to be squeezed from that turnip..
Jump forward two decades to 2015 and the moment of the RAND exploration. The Institute of Medicine's (IOM) To Err is Human shocked many with its estimate of over 100,000 medical deaths a year. The IOM follow-up, Crossing the Quality Chasm pushes team care to limit the disrespectful communication, bullying and related problems of silo-based practices. The concept of "value-based medicine" began to take. 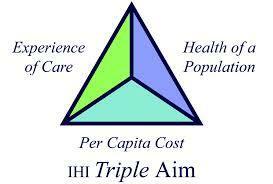 The Affordable Care Act catapulted this values approach by infusing medical delivery with new payment incentives. The Triple Aim captured the outcomes movement: better patient experience, enhance population health and lower per capita costs. Thus when Herman and Coulter convened a focus group of medical system administrators and policy players to help answer the "professions or modalities" question, they might as well have been in a different country than US medicine circa 1995. The assembled team quickly "reframed the meeting's topic from a focus on what would be needed to increase the scope and utilization of CAM providers to what would improve population health and achieve the triple aim." This is a new era. Medical delivery leaders are speaking of the need to move from sick care to creating health. The chance for these integrative practitioners to be valued contributors of new approaches with multiple modalities in a values-based system has arrived. Responsibilities for the practitioners are significant. The RAND report urges them, as licensed professionals to become skilled players in the multi-modal teams promoted under the Triple Aim. The good news in this work is that easily accessible resources now exist of multiple studies on the positive impacts of these professionals on patient experience and on the healthcare costs - Triple Aim targets. These resources to shape a new dialogue were not available in 1995.